The fun wall decals in this Tinker Bell Very Fairy Decorating Kit let you quickly add Disney design and personality to your kids' bedrooms, playrooms, and even classrooms. 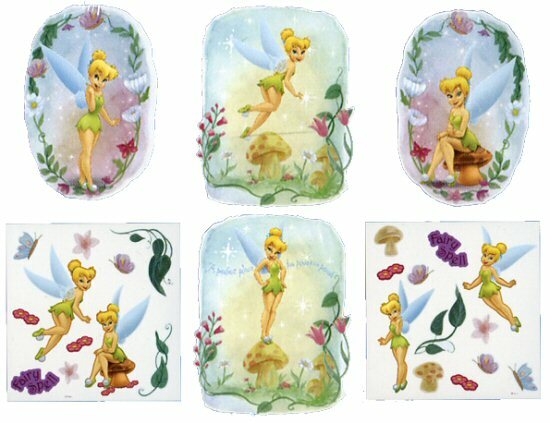 The wall stickers in this Tinker Bell Very Fairy Decorating Kit include Tinker Bell in many poses, along with many coordinating accent pieces. Our Tinker Bell Very Fairy Decorating Kit features wall decals that are repositionable, removable, and re-usable... the perfect combination for wall decorations used in decorating children's rooms. This Tinker Bell Very Fairy peel & stick decorating kit offers decorating ease with no damage to the surface or sticky residue left behind, so go ahead and add a little Disney magic to your home with this unique and fun concept in decorating. Wall Art: 8.5" x 11"